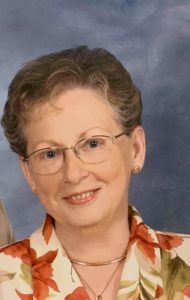 Virginia L. Newhouse, 77, of Lincoln, passed away March 10, 2019 at home surrounded by her family. Visitation will be from 11 AM until 12 Noon Thursday, March 14, 2019 at Holland Barry & Bennett Funeral Home. Funeral services will follow at 12 Noon with Pastor Greg Wooten officiating. Burial will follow in New Union Cemetery, Lincoln. Virginia was born May 21, 1941 in East Liverpool, OH., the daughter of Raymond and Edith (Flanigan) Dyke. She married Norman Newhouse on March 14, 1964 in Lincoln. Virginia was formerly employed at Lehn and Fink. She was a homemaker. She volunteered for Hospice and the Logan County Food Pantry. Virginia enjoyed crocheting and loved Christmas. Surviving are her husband Norman Newhouse, children: Dianna Newhouse and Kevin (Roni) Newhouse; grandchildren: Amber (Alex) Rogers and Jennifer (Greg) Henington; great grandchildren: Olivia, Jacob, and Owen; sister Shirley(John) Chambers; nieces and nephews: Dana, Doug, Jill, Michael, Wayne, Larry, and Pam; several great nieces and nephews also survive. She was preceded in death by her parents, brother Robert Dyke, sister Patty Ewins, and nephew Donnie Fulk. Memorial donations may be made to Memorial Home Hospice and will be accepted at the funeral home.